sorry for this copy/paste article without kml attachment again, but thought would be good though to store here some read about such astounding global phenomenon. In October 2017, a long, narrow stream of clouds, storms, and moisture stretched across the Pacific Ocean for more than a week. Called “atmospheric rivers”, such features are relatively common in the North Pacific in the fall and winter, routinely bringing heavy rains and snow to the Pacific Northwest and California. What made the October 2017 atmospheric rivers most notable was their length. At times, the flow of moisture extended roughly 5,000 miles (8,000 kilometers) from Japan to Washington. “That is about two to three times the typical length of an atmospheric river,” said Bin Guan, a researcher at the Joint Institute for Regional Earth System Science and Engineering, a collaboration between NASA’s Jet Propulsion Laboratory and the University of California, Los Angeles. The length and duration of this atmospheric river made for mesmerizing sequences of satellite images. The natural-color mosaics at the top of the page show how the skies over the Pacific Ocean appeared on October 14 and 17, as observed by the Visible Infrared Imaging Radiometer Suite (VIIRS) on the Suomi NPP satellite. Pushed by jet stream winds, the line of clouds began to extend westward from Asia on October 12. 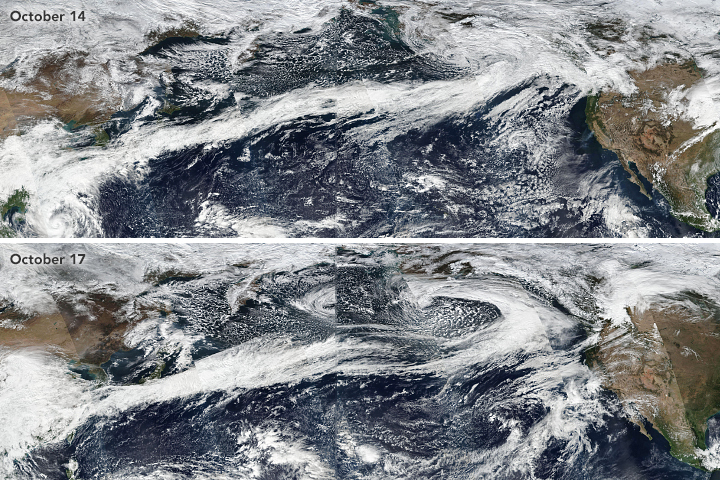 By October 14, a near continuous cloud line stretched all the way to the west coast of North America. “If you look closely at VIIRS imagery between October 16 and October 18, you’ll notice that this atmospheric river is really comprised of a series of waves—extratropical cyclones in various life cycle stages—progressing along a semi-stationary storm track,” said Bryan Mundhenk of Colorado State University. For instance, a comma-shaped cyclonic feature—and a temporary break in the line of clouds—is noticeable at the eastern edge of the October 17 image. While there are few ground-based weather stations in the North Pacific to tally how much rain fell over the ocean, satellites such as those participating in the Global Precipitation Measurement (GPM) mission can estimate precipitation rates from above. The animation above, based on data from the Integrated Multi-Satellite Retrievals for GPM (IMERG), shows rains accumulating in a narrow band across the Pacific between October 11 and October 22.